We all want our weddings to be different than anything anyone has seen before. 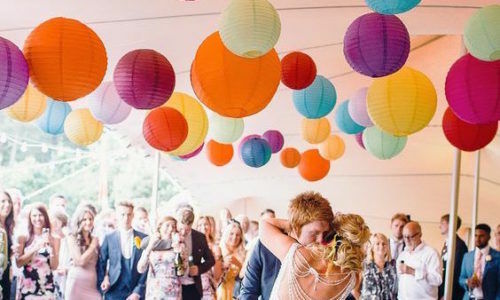 One way to achieve this goal is to work with a unique colour palette for your wedding colours. Inspiration can come from anywhere, and if you know where to look then you can get a colour scheme in no time. A good combination sets the mood, so use these ideas to get a wedding colour sequence that is sure to impress. A very popular wedding setting at the moment is the country summer theme. A colour arrangement that goes perfectly with this is navy, yellow and blue. This is down to earth yet at the same time sophisticated. If you’re having an autumn wedding, colours to keep it elegant yet rustic are cinnamon, yellow and beige. These colours give off a Spanish vibe but also keep a traditional wedding theme, especially if there are classical elements such as a tall, tiered cake and place settings. Everyone wants a relaxed, open outdoor wedding, and a colour combo that keeps a neutral feel whilst being sophisticated are gold peach and green. When being outside, why not take some inspo from mother nature herself, complement the greenery and keep the open-air connection to the outdoors? A wedding by the beach pairs perfectly with poppy, Caledon and white. This colour combination is an alternative choice for a beach theme. This can be a good alternative to the predictable waterside blue hues and it is a perfect option to grab people’s attention. The white and Caledon complement the sand and poppy is a bold colour that goes impeccably with the soft neutrals. A year-round colour palette is sage, gold and ivory. These colours can go with anything so it is an opportunity to go home with decor according to the season or venue. Because these colours are neutral they can pair nicely with anything! A modern fall scheme with a touch of contemporary is yellow, grey and silver. This theme pairs perfect with an industrial space with graphic prints, clean lines and sleek details. For a more rustic look opt for grey accents with concrete. A wholesome, natural colour palette is merlot, peach and sage. This pairs great with a late summer wedding with a rustic vibe. Add some natural wood to balance out and complement the natural surroundings, especially if chandeliers or some sparkle is added.